Buffalo Sports Page Draft Guru Bob Gaughan has started to shape his Draft board. Here are his top five players at each defensive position. 1. Bradley Chubb- NC State– Best pass rusher in the class. His best game may have been against Louisville with his pressure on Lamar Jackson. 2. Arden Key- LSU– Weight has gone from 230 to 270 and now around 255. Higher upside than Landry, built like Jason Taylor. 3. Harold Landry-Boston College– Injuries slowed him this year. I love his first step quickness. Was number one pass rusher coming into this year. 4. Marcus Davenport- UTSA– See as a OLB in a 3-4. He has a high ceiling but a low floor. See him as a boom or bust guy. 5. Sam Hubbard- Ohio State– comes from loaded OSU line. Solid player that has the non-stop motor that helps him get sacks. 1. Da’Ron Payne- Alabama-an elite run stuffer that showed he can do it all in a great national championship game performance against Georgia. 2. Maurice Hurst- Michigan– a pure three-technique player. He can do one thing very well and that’s penetrate and live in the opponents backfield. 3. Vita Vea- Washington– a wildcat QB in high school. A great athlete for his size 335 lbs. Great ability to track down for a man his size. 4. Harrison Phillips- Stanford– The tape shows he can handle the run but in the Senior Bowl he showed pass rush ability. Can play the 2 gap or the one gap. 5. Derrick Nnadi- Florida State– little short but that’s the only negative you can say. Haven’t seen him play a bad game. 6. Tie- Tavern Bryan- Florida– the guy with the most powerful hands in the group. His upside his he could be the next Suh. 1. Tremaine Edmunds- Virginia Tech– Looks more like a basketball player. What an incredible athlete. On draft day he’ll still be 19 years old. 2. Roquan Smith- Georgia-outside Will LB should be his best suit. Fast and physical guy that can cover athletic backs. 3. Rashaan Evans- Alabama– part time starter before this year because sitting behind Reuben Foster. Could play in 3-4 or 4-3 system. 4. Malik Jefferson- Texas-great athlete that is at his best when he attacks whether than read and react. Great upside but better athlete than football player right now. 5. Jerome Baker- Ohio State –undersized but athletic LB. Think Darron Lee, former Buckeye. Great speed to cover in slot if needed. 5 tie Leighton Vander Esch- Boise State– one year of productive starter may raise questions. Huge development from walk-on to now a guy being compared to KJ Wright. 1. Denzel Ward- Ohio State– lack of size only negative. Sat behind Conley and Lattimore last year. Very good in press coverage. 2. Josh Jackson- Iowa– incredible 8 interceptions this year. Natural ball hawk. 6’1 can match with bigger WR’s. 3. Jaire Alexander- Louisville-love this guy, has played in every coverage of defense. His great burst to the ball jumps out in games. 4. Isiah Oliver- Colorado-meets the eye test for the ideal NFL corner. Freakish speed should be shown off at the combine. 5. Mike Hughes- UCF– UCF was legit this year with guys like Hughes that will be drafted high. Plays tough in spite of lack of size. 5 tie Carlton Davis- Auburn– ideal size for an NFL corner. Has tools to play that physical style some teams will covet. 1. Minkah Fitzpatrick- Alabama– Versatile can play nickel, safety or corner. Will be a top 10 pick. Can cover and punish. 2. Derwin James- Florida State– top safety coming into the year slipped. An alpha male that will be a voice and leader in the locker room. 3. 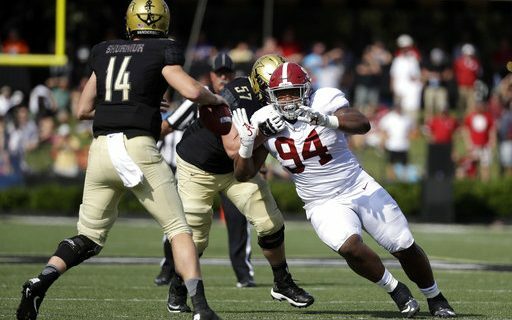 Ronnie Harrison- Alabama– ideal size and traits to be a Pro Bowl player. Leads with his should to lay the lumber on players but can miss tackles because of it. 4. Marcus Allen- Penn State– versatile playmaker for the team. He was the guy two years ago that blocked the field goal for a TD to beat Ohio State. 5. Justin Reid- Stanford– I love all Stanford defensive players in this draft. The younger brother of 49ers safety Eric Reid.